How much does your wardrobe really cost? A worker in the Tazreen garment factory in Bangladesh, 20-year-old Sumi had started her 10.5-hour shift at 8am as usual, but then a workmate came in to say something was burning in the building. “We tried to escape the fire but our middle managers and supervisors just told us to get back to work,” said Sumi (pictured above, right), speaking through her fellow labour rights activist, Kalpona Akter (left) from the Bangladesh Centre for Worker Solidarity. “The doors to the women’s stairs on the fifth floor [where we were working] were locked, so we used the men’s stairs to get down to the second floor but then we saw the fire. We went back up to the third floor to try to get out but power had been cut so it was dark and everyone was panicking. 1500 workers were trapped. I jumped out of the building from the third floor because I thought that way, at least my parents would find my body, otherwise I would just be burnt to death. Sumi recounted her story quite calmly – from her seat on the stage, as her injuries make it impossible for her to stand for too long, especially after a tiring day protesting against Peter Alexander (which is part of the Just Group – more on this here) – but as a member of the audience it was impossible not to get emotional on her behalf. Here was a woman who had been working in the industry for seven years (Sumi began work at 13) and had been mistreated throughout her working life (factory doors were locked and workers were slapped if quotas were not reached). Now, at the age of 20, when her counterparts in developed countries are still studying or have just started their careers, many of her co-workers are dead and she is injured – quite possibly permanently, with no financial support or counselling that those of us in the west would receive if anything remotely similar happened. And all so that consumers in countries like Australia, the US and the UK can pay a few cents less for jeans that they might wear twice before throwing out, contributing to the tonnes of fashion that ends up as waste (but that’s a whole other topic). Speaking of jeans, 80 garment workers can make 1200 pairs a day, according to Kalpona. Those jeans might sell for about $75 a pair in the US. But the workers who make them earn only $68 a month. (She said a living wage in Bangladesh would be more like $300 a month). Yes, those workers doing 10.5-hour shifts (six days a week, I think, or possibly even seven days a week?) don’t even earn the same amount as one pair of jeans retails for in the fast fashion chain stores. The reaction from some people in western countries after the Tazreen and Rana Plaza disasters was to boycott garments made in Bangladesh. But Kalpona said that for a country where 80% of foreign currency comes from garment manufacturing, “boycotting would be suicide”. She wanted consumers to keep on buying clothes “Made in Bangladesh” – but to put pressure on the labels to sign the Bangladesh Fire and Building Safety Accord and to improve and maintain working conditions in other countries where garments are made too, such as Cambodia and China. As a very atypical consumer (I rarely buy new clothes as I make everything myself or buy at op shops) I would actually be advocating for people to think twice before spending money on cheap up-to-the-minute trend items because it’s this furious pace of fast fashion that has created so many of the ethical and environmental problems we are experiencing today. But if people only made considered choices when purchasing fashion, I suppose many garment workers would lose their jobs as there would be fewer clothes to churn out. What’s the solution to more sustainable mass market fashion, then? I don’t know, and it’s a topic that is too big to cover in one blog post, but for a start it certainly wouldn’t hurt for companies to start paying workers fairly – and for consumers to pay what would amount in some cases to only a dollar or two more to ensure their clothes have been made under fair conditions. 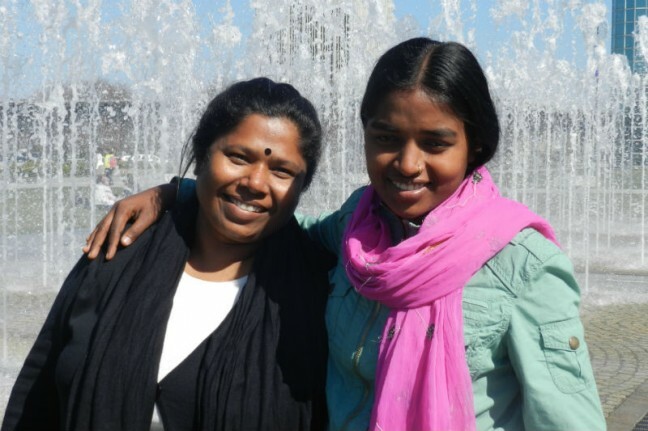 Sumi and Kalpona – and thousands like them – would certainly thank us for it. *I planned to share interviews with ethical fashion leaders at the end of each month on this blog, but for comparison’s sake I decided it would be good to hear from workers who are employed by the conventional fashion brands. If you’d like to read the first interview in this series, click here.